Back to the Ohio Wheelmen HOME. Please REFRESH this page to get the latest version. It's expected that regular events from past years will be attended by Wheelmen this year. These events include the Great American Brass Band Festival, the Minster Oktoberfest Parade, and many others. If your local area has a parade, offer to ride your bicycle and help promote The Wheelmen. Opening day at Ohio Village will feature 1890s sports activities. 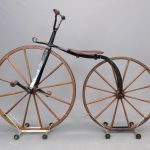 Bicycle racing was big at that time and Wheelmen have been invited to exhibit and demonstrate period bicycles. Join a crowd of Midwest Wheelmen for a weekend of free brass band music, a wonderful parade, and hot-air balloon race. Wheelmen have been requested to exhibit during the Museum's activities while the GOBA bicycle tour riders are in town for their first overnight stop. More details later and will probably be an afternoon activity. We've been there for several other activities in recent years. Wheelmen have been requested to ride in the Unity Days festival parade. We have enjoyed this parade for the last several years. Come and join us! Visit quiet, quaint Mackinac Island where the fastest transportation is by bicycle! Get some fudge, ride big circles around the island, ride a century, ride an OHWT, pile some rocks on the shore, tour the fort, and many other activities on the island. More information is on The Wheelmen 52nd Meet page. The Meet registration form is found on that page. A large gathering of about 800 classic, pre-1932 automobiles takes over the village for the weekend. About 100 Wheelmen machines on display, demonstrated, and ridden around the village. Casual games are played and ice cream is served. Early Sunday morning, an OHWT is ridden through the quiet streets of Dearborn. Come join the fun, it's just a bit north of the state line! Old Car Festival Info . Wheelmen need to pre-register their machines. Oktoberfest Parade at 2:00 pm. This is a huge parade in a small town. We are planning to have an OHWT 10 mile ride in late-morning before the parade. Be there are ready to ride at 10:00 am for the OHWT. A beautiful route has been found from Minster, through Fort Loramie, through Lake Loramie State Park along Lake Loramie, and back to Minster. A variety of vintage and collector cars will highlight this car show. Wellington is just 10 miles south of Oberlin where the Wheelmen Annual Meet was held last year. A few Wheelmen will exhibit and demonstrate bicycles at the show. Proper machines and period clothing required. Please contact the Ohio Captain if you are interested in participating. Parade during bicentennial celebration in Rockford, Ohio. A (long) stone�s throw away from the Bicycle Museum of America. This will be the 50th anniversary of The Wheelmen participating in the Old Car Festival at Greenfield Village. The Old Car Festival is the longest consecutive antique car show of its kind in America. 2020 will mark the 70th year when generations of car owners share their passion with festival-goers. More information will be forthcoming, check The Wheelmen events page later this year. Been There, Done That in 2019! Memorabilia Meet, Swap Meet, and Ride Around Town. Come see memorabilia from the Wheelmen era of pre-1932 cycling. Hosted by the Bicycle Museum of America from 9:00 am until 3:00 pm. Reserve a $10 table with an e-mail to Micayla at the museum. Those with reserved tables may enter at 8:30 am to set up their table. We expect a wide range of collections including cyclometers, lanterns, sheet music, badges, ribbons, tools, and more. Take a video virtual tour of the Bicycle Museum of America. Depending on the weather that day, we will also ride around town again. So, if the weather looks favorable, bring a bike! A set of photos from the 2012 Memorabilia Meet are on The Wheelmen website. A set of photos from the 2011 Memorabilia Meet are on-line. Check the photos from the 2010 Memorabilia Meet. The Ohio Bicycle Federation conducts an annual advocacy day in the Statehouse Atrium. The Wheelmen have been invited (again) to showcase the history of cycling in Ohio. Annual Copake Bicycle Auction on Saturday with all-day Swap Meet & OHWT ride (3:00 pm) on Friday. Been There, Done That in 2018! Memorabilia Meet, swap meet, and Ride Around Town. Come see memorabilia from the Wheelmen era of pre-1932 cycling. Hosted by the Bicycle Museum of America from 8:30 am until 5:00 pm. The 2018 schedule is available as a guide. Reserve a $10 table with an e-mail to Micayla at the museum. Those with reserved tables may enter at 8:00 am to set up their table. We expect a wide range of collections including cyclometers, lanterns, sheet music, badges, ribbons, tools, and more. In the morning, we'll have two presentations in the Lock One Theater across the street from the museum. Dan Gaier, Ohio Wheelmen, will discuss Bicycle Spoke Wrenches. We have an opportunity for another speaker. 27th Annual Copake Bicycle Auction on Saturday with Swap Meet & OHWT ride on Friday. The homes in Dayton Lane Historic District were built between the mid 1800s through about 1920. The architecture and styling vary as much as the number of years or decades. With over 200 structures, you will not find any two identical homes. Even homes that were built at the same time, by the same owners are different in detail and character. History comes alive when Dayton Lane Historic District of Hamilton, Ohio hosts the Bi-Annual Historic Home Promenade from 1:00 pm - 5:00 pm. The streets are closed to car traffic. The festival organizers have asked for some Wheelmen to once again ride in the lane and provide a bicycle exhibit. Ride around Dayton Lane and visit historic homes! If you would like to participate, please contact Randy Fry, Wheelmen in western Ohio. Great American Balloon Race - Entertaining the crowds at the Great American Balloon Race will start about 5:00 p.m. on Friday evening at the Stuart Powell Field airport south of Danville. Or use an alternate website by the GABBF. The newspaper magazine AMERICAN PROFILE had a short article about the GABBF in the May 30, 2011 issue. Great American Brass Band Festival - The Wheelmen will participate in the 11:00 a.m. parade on Saturday. The probable gathering spot for Wheelmen before the parade is the Constitution Square State Park on Main Street. Before the parade, we'll probably meet for breakfast at the Red Rooster restaurant one block east from the park. Immediately after the parade, I expect us to be invited to an 'office party' for a luncheon buffet. After the parade we'll ride around festival sites around town. From 1:30 pm until 2:30, we also staff an exhibit area on College Street (where it is closed for the festival between Walnut and Grant Streets). Overnight dorm space is available but you need to submit your name early. If you want to participate, send Alison P Torpey a note NOW. Even if there is not a dorm room available, you can surely come and participate in all the Wheelmen activities. A ten-mile, Sunday morning ride will be an option. We found an interesting route out of Danville into the rural countryside along with local bike riders. A bunch of photographs from past years are available on a gallery page. Contact Alison for further information. To celebrate 90 years of arts, entertainment and cultural education in Hoover Auditorium, there will be a multimedia exhibit on display from June 16-30, as well as several other celebratory events during Weeks 1 and 2. Join us in sharing and celebrating your favorite memories in one of Lakeside's most cherished buildings. The Wheelmen have been invited to be a part of this significant event at Lakeside. The Lorain County Historical Society conducts an annual History Camp for children. This year, the focus one morning will be on transportation, including bicycles! 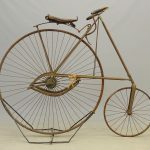 The Ohio Wheelmen will have a exhibit and will demonstrate riding the high wheel bicycle. This evening parade is a prelude to a fantastic air show on Saturday. The parade steps off at 7:00 pm so we will need to line up at 5 or 6 pm. Contact Randy Fry for details and to sign up. A variety of vintage and collector cars will highlight this car show. The event will take place from 4-8 p.m. on a Monday during Wellington's bicentennial week. Wellington is just 10 miles south of Oberlin where the Wheelmen Annual Meet will be held a few weeks later. Bluffton Ride to Remember is in an area with level terrain, the "mountains" you will climb are highway overpasses. Sounds good for a fast half-century, metric-century, or a full century! This could be a good training or tune-up for a century run at the Annual Meet later that month! This is not an "official" Wheelmen event. The organizers have suggested this ride for Wheelmen since Wheelmen have ridden in the past. It is a "pay ride" and is supported as you can see in their web page. All proceeds go to the Bluffton Lions Foundation's Bike and Pedestrian Pathway. Yes, that says OBERLIN, OHIO! We have been asked by some in Wheelmen management to host the meet in 2018. Check this event website for information as the meet is developed. Plans are progressing for activities with historic Oberlin College and the city of Oberlin, located just southwest of Cleveland. Preliminary and planning information will be updated on this page. Come EARLY for the fun along the North Coast! Museums, amusement parks, beaches, water parks (indoor and outdoor), and more! We had two high wheel bicycles, a hard tire safety, and an 1885 Mascotte lady's tricycle in the parade this year. Huge parade in a small town. Looking forward to next year already! We had a good turnout of high wheels and the lady's tricycle. Oktoberfest Parade at 2:00 pm. This is a huge parade in a small town. We usually have about 15-20 Wheelmen (young, old, and in-between) riding! Mel's Decorating is our sponsor each year! Many thanks to Mel's for providing sponsorship! For more information on these events and/or to indicate your intentions to participate, please send an e-mail to the Ohio Wheelmen Captain. The Wheelmen national organization has an event list. NOTICE: This is a page for the OHIO WHEELMEN. This material is used with permission. Most of this material is copyrighted by The WHEELMEN or the Ohio Wheelmen. Macintosh computer, MS Word (text mode), Apple Safari, Firefox, and Fetch.